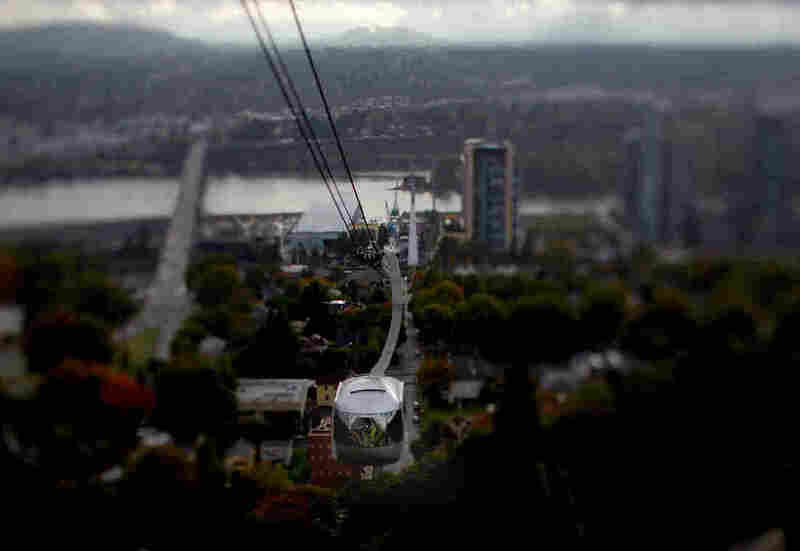 How To Solve A Sky-High Commuting Conundrum In Portland, Ore., doctors and patients get to the Oregon Health and Science University not by a twisty, two-lane road up Marquam Hill, but by a gleaming silver gondola. The aerial tram has cut the commute from up to 45 minutes to a three-minute ride in the sky. NPR explores efforts to solve commuting challenges nationwide. 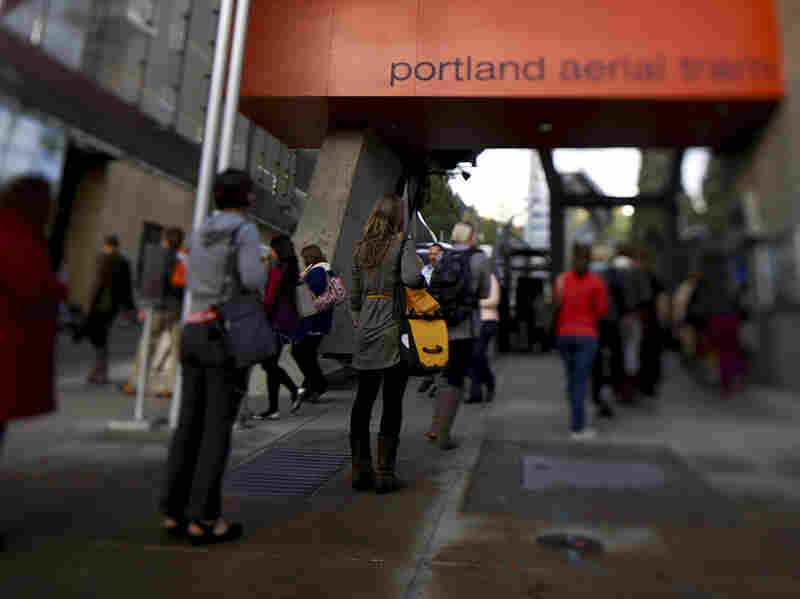 In Portland, Ore., an aerial tram connects commuters, doctors and patients from the south waterfront area to Oregon Health and Science University in the west hills. This story is part of a series on commuting in America. Imagine a hospital on top of a mountain. How would doctors and patients get in and out? In Portland, Ore., commuters don't have to drive up a twisty, two-lane road to get there. Instead, they glide up 500 feet in the air in a gleaming silver gondola. Portland's aerial tram connects the south waterfront down near the river to the Oregon Health and Science University on top of Marquam Hill. For nurse Sara Hone, it has changed her commute. "I love it. I can't imagine a time without it," she says. Traveling to the OHSU hospital via the aerial tram takes three minutes. Driving up the twisty mountain road is typically 20 minutes but can be up to 45 minutes depending on traffic. On a bad day, the trek up the windy hill could take up to 45 minutes. Now it's a 3,300-feet, three-minute sky tram ride with beautiful views of the city. "OHSU, through somewhat an accident of history, wound up being built on Marquam Hill, which is essentially the top of a mountain," says Mark Williams, vice president of campus development. In 1880, a railroad company bought the land for a depot without looking at it first; then, realizing it would be too difficult to use, later donated it to OHSU. The hospital started small 125 years ago but has now grown to be a huge enterprise. It's the only academic medical center in Oregon and the largest employer in Portland. 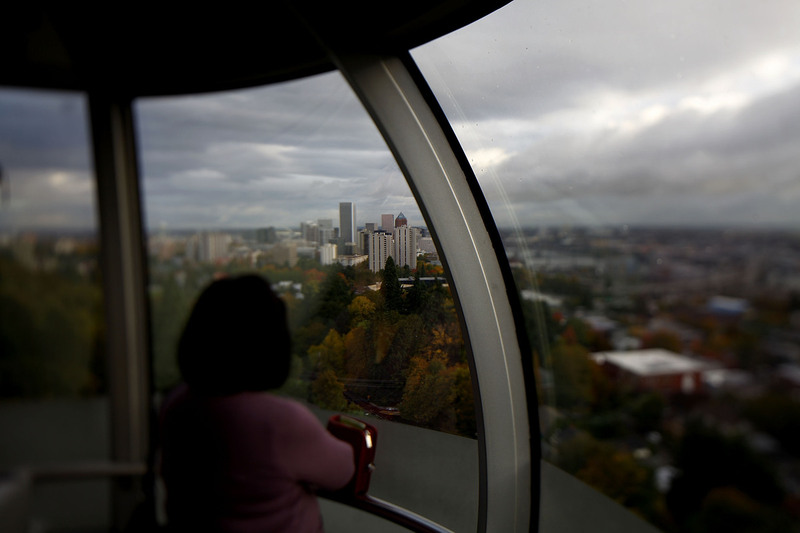 Passengers wait to board the aerial tram, which whisks them up and over Interstate 5 and surrounding neighborhoods. "We have slowly but surely occupied this entire mountaintop. We are essentially landlocked and capped. We can't build anything new to meet any new demand until we knock something else down," Williams says. And there's no place to park. But down at the bottom of the hill, just on the other side of Interstate 5, is a big swath of flat land perfect for parking and for the medical center's expansion. All that was needed was a quick way to get people up and down. "We can't function having a brain surgeon spend 45 minutes in traffic and call that a viable campus to get from one place to another," Williams says. They considered a streetcar, a dedicated express bus lane, even a tunnel, but Williams says by far the best option was the sky tram, which opened in 2007. It's linked to the city and surrounding suburbs by an extensive public transportation system. Commuters have several ways to get here.They can drive and park, take the light rail to the streetcar (which stops just feet from the tram), walk or bike. And for cyclists, there's free valet parking, run by Kiel Johnson. The service is popular. Neuroscience student Nora Hammock is one of his customers. "It's the best. It's so lovely to be able to ride up and drop my bike off," Hammock says. "It's safe and dry the whole time, and I get to ride to work in one of the most unique transportation systems." And for patients — and anyone who works on the hill — the sky tram ride is free.